WARNING: These tiny lobsters will quickly multiply until they become an army. You have been warned. 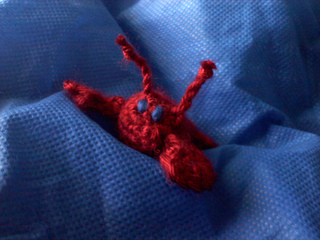 The lobster are the fourth pattern in my Teeny Tiny Series. 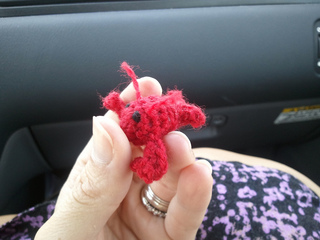 The Teeny Tiny Lobsters only take about a 15 minutes each and were designed to use a very small amount of yarn. They’re perfect for that tiny bit of luxury yarn that you don’t want to waste but doesn’t seem to be enough to make anything else. 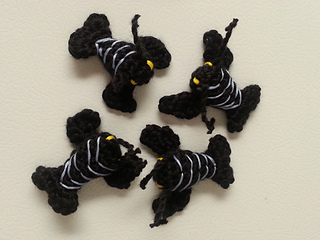 Stick a magnet in them and watch them take over your fridge, hang them on the Christmas tree and have a lobster filled Christmas, make enough for all your friends to have one, or use them as fun and unique party favors! 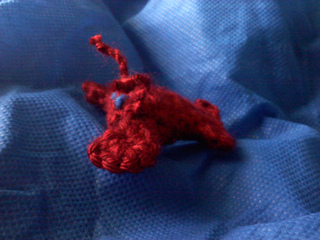 They can easily be made a bit bigger or even smaller by using different yarn and hooks. The possibilities are endless. 02/10/2016: Some people have been having trouble with the claws on their lobsters, so I’ve uploaded a new file with more detailed instructions.